San Jose Elementary School is an education facility to around 500 indigenous B'laan children. 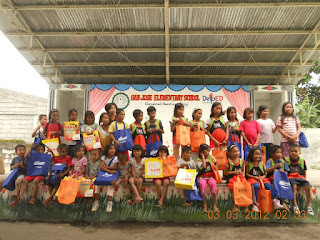 It is a secluded government school unit in the north side of General Santos City. While this community is lavished with beautiful green scenery, they fell short for medical and dental needs along with their school needs. Teachers have to hire a "habal - habal," a private motorcycle, for a 30-minute ride to over 500m - above sea level school and pay an awesome PHP 90.00 for a day's load. The community simply relies their main livelihood on agriculture and any help they can get shall highly assist their spartan living. So, as part of GenSan Run Club's advocacy, we are raising 500 pairs of slippers, school supplies and the needed medical supplies for the mission. I then appeal to anyone who wish to extend their help to join us in this cause and make these school children smile.